Earlier in this piece, I called out the Frontierland track as one of the big reasons to move ahead with a second version of the audio project. 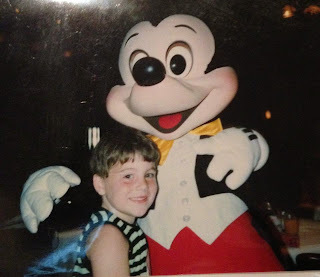 The other big reason was my dissatisfaction with the first Tomorrowland track. It's odd to think that as recently as three years ago, there was simply no information about the historical "sound" of Tomorrowland in existence. Enervated by the first version of this project, I was eventually able to fill these gaps and present a more or less complete chronology. This, as much as these tracks, represents some of my proudest moments as a WDW researcher. The original Tomorrowland area music emanated from a scarce number of speakers; historical photos show speakers on the central light poles down the middle of the land, and we can be sure there were a few others stashed here and there too. As always with early MK BGM, just because something was playing, doesn't mean everyone heard it. The earliest Tomorrowland BGM was preserved by Mike Cozart on a typed playlist from Jack Wagner's estate; he kindly provided me with the list and the information that he had already located several of the tracks in the Capitol Media Music line. From there, collaborating with Michael Sweeney, I was able to find enough internet listings of the Capitol Media Music line to determine where the tracks came from and begin to hunt down the source material. The resulting loop is very reminiscent of early EPCOT Center. 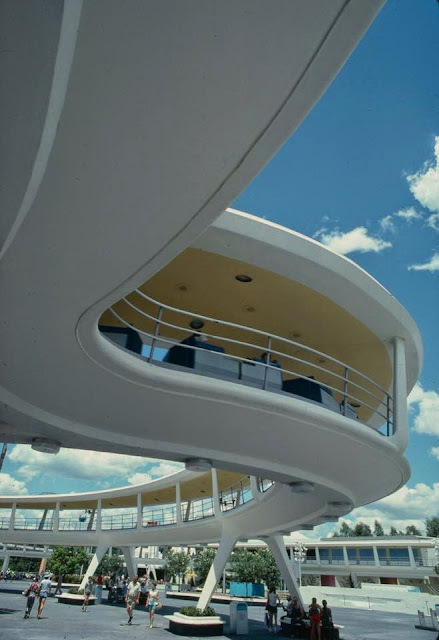 Probably inspired by photos and concept at of Tomorrowland's grand, magisterial architecture, Wagner turned to Media Music tracks intended to accompany scenes of nature, National Parks, and science. The music has a disarming, sweeping quality quite unlike the synth-pop we're now accustomed to. This project marks the Premiere of the 1972 music. The project begins with a brief snippet from the launch sequence from Mission to Mars. This attraction and its predecessor lacked any real formal music score, but by including a bit here it was possible to ensure that the show at least had some sort of representation in the project. 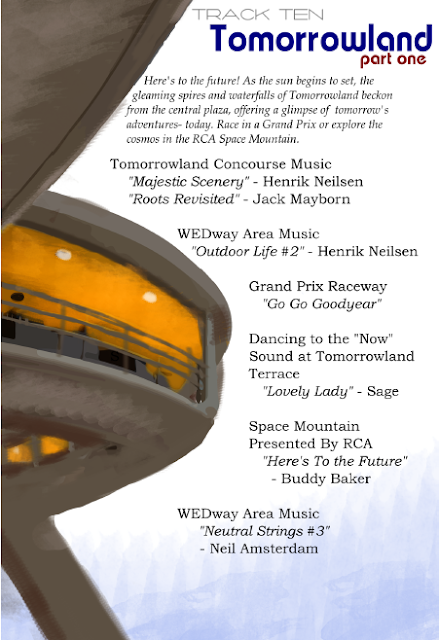 This first selection, which played in the "Concourse" section of Tomorrowland (think of those huge sloping walls), is "Majestic Scenery" by Henrik Nielsen, and the second is "Roots Revisited" by Jack Mayborn. The sound of the Tomorrowland entrance waterfalls is based on a pitch-corrected version of the Cosmic Ray's waterfalls recorded in January 2014 overlaid with a waterfall recorded at Animal Kingdom in late 2011. There's next to no audio record of what those falls sounded like going at full blast, so this is a best guess approximation. WEDway Area Music - The next selection represents the next "era" of Tomorrowland's musical backdrop, which began when the WEDway Peoplemover began operation in summer 1975. 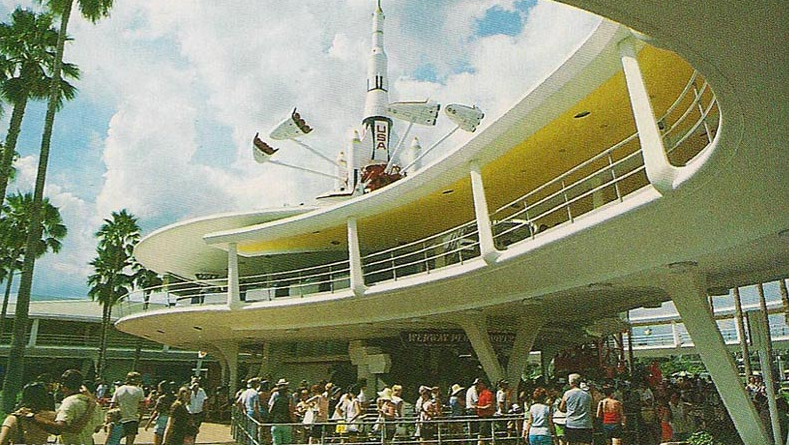 The WEDway track wound through all of Tomorrowland and the track had its own unique music loop, effectively drowning out whatever music happened to play on the ground level of Tomorrowland. 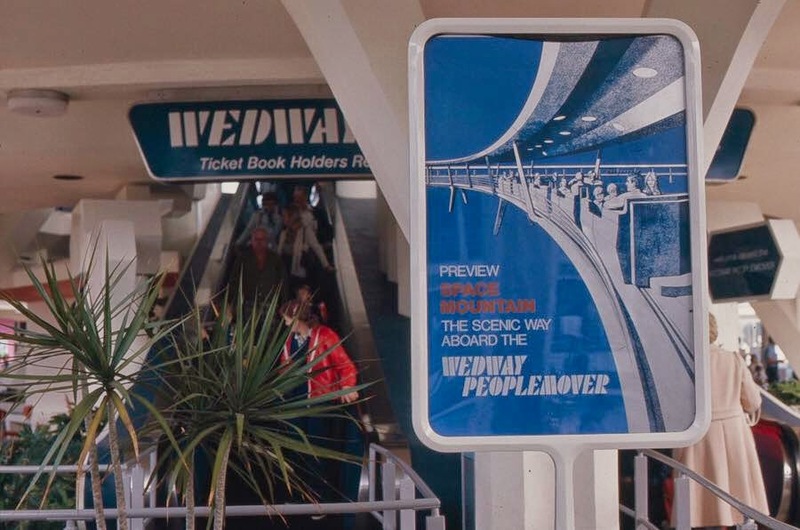 Originally, the WEDway played the same music loop as her cousin in Disneyland, a simple loop of the Disney-scored Monorail Song and World on the Move, repeated endlessly. In 1976, Wagner licensed additional tracks from Capitol Media Music, creating the delightfully jazz-lounge loops which are still remembered today. Michael Sweeney and myself identified the WEDway loop pieces through process of elimination since no playlist existed. The first selection is "Outdoor Life #2", by Henrik Nielsen, sourced from the original LP. Grand Prix Raceway - sadly, no source music exists for the original Jack Wagner Grand Prix loop, which is in the Mike Cozart collection and which he refers to as sounding a lot like the "theme from CHiPS". The track I use here is taken from the load area of Disneyland's Peoplemover, which was sponsored by Goodyear, and is an instrumental arrangement of their corporate jingle at the time. Goodyear also sponsored MK's Grand Prix, so this track is used to represent the Goodyear sponsorship as much as the attraction. The Grand Prix noises underneath were recorded in 2011, 2012 and 2014. Tomorrowland Terrace - much like Disneyland's version, the restaurant which was re-themed into Cosmic Ray's originally hosted a number of local and "resident" bands playing the "hits of today". The original "Resident" group was Dallas Sound Track or DST, with frequent appearances by the Kids Next Door, a squeaky clean youth vocal group who Disney effectively bought out and re-named "The Kids of the Kingdom". Sadly, there's no real recorded performances by Dallas Sound Track and Kids of the Kingdom did cut a record in the late 60s, but the sound is totally inappropriate to the Tomorrowland atmosphere I wanted. While looking through vintage WDW ephemera, I came across a Thanksgiving 1972 ad touting an appearance by "SAGE - Dancing to the "Now" Sound". Most of my leads for these groups had been dead ends, but Sage turned out to be a Tampa-based 60s-tinged garage rock group. Better yet, they had cut a record. Best of all, they were actually good! The album is called "Sage by Sage" (I know), and it's also been reissued on CD by Radioactive Records. It's a terrific little indie record, and Sage provided exactly the keynote of atmosphere that I wanted - an era when Tomorrowland crazily juxtaposed smooth jazz, midcentury rock, and space fantasy to create a heady blend of youth and future unlike anything at Walt Disney World today. Space Mountain presented by RCA - Rebuilding Space Mountain's 1975 show accurately turned out to be one of this version's major projects, perhaps unexpectedly. It wasn't until I was receiving live recordings by Jerry Klatt and Mike Lee that I realized that the original soundscape was more complex than I thought, and that this was a challenge worth meeting. The Jack Wagner safety spiel which kicks off the track originally played outside the attraction proper. It was added in 1976 after numerous guest injuries and remained there into the 1990s. This is a live recording provided by Mike Lee. The entrance room of Space Mountain, where the floor slopes down into the railroad track tunnel, originally contained a unique ambient loop of tones - menacing "outer space" tones - which is almost a lost track. I became fascinated after hearing them in Jerry Klatt's live recording (from 1975!) and tried to seek them out. It turns out that this track is in common circulation - mixed into the background of another loop! It's most commonly heard behind the "com chat" track, which plays in Florida's boarding area. What seems to have happened is that for the Disneyland show in 1977, somebody decided to play the "com chat" in the attraction's entrance area. Accompanying the com chat was the original "entrance tones", placed at the entrance because, well, that's where they were supposed to go. At some point it was forgotten that the two tracks were intended to be separate and somebody eventually replaced Florida's unique load area mix with the Disneyland entrance mix. I was able to separate the two tracks in Audacity and presented here is the sound of the original 1975 Space Mountain entrance area. Underneath the train tracks, the first airing of Buddy Baker's eccentric "RCA Leads the Way" theme was heard, alongside displays of RCA products. Baker’s 1975 Space Mountain music is very unique. 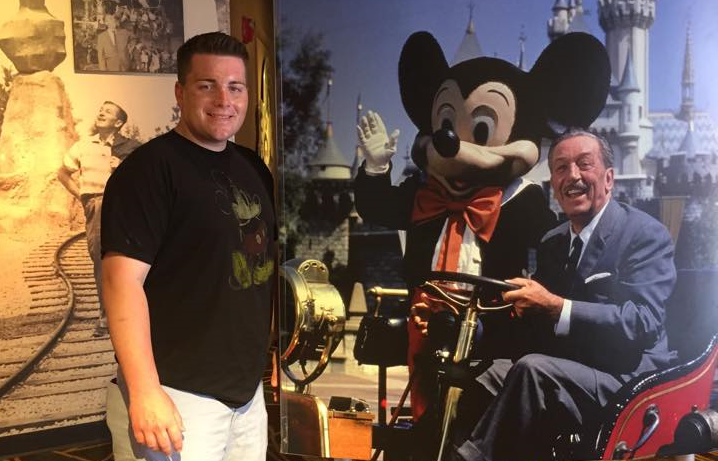 It is of a piece with his other 70s compositions which experimented with “modern’ sound – America Sings and the Carousel of Progress – but is by far the least successful of this group. In the 70s, Space Mountain was a hornet’s nest of weird synth and guitar licks, and putting all that music in the proper order can yield interesting results. Thanks to Greg Maletic for sending along a higher-quality version of this first "RCA Leads the Way" track. After the RCA tunnel, the Space Mountain queue slopes back upwards and zig-zags past a series of windows. 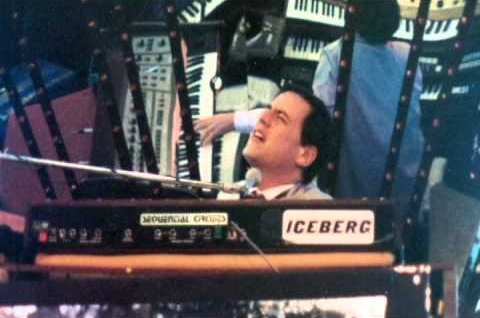 Placing the appropriate keyboard-freakout synth in this area was made possible by recordings from 1983 made by Dave McCormick. Originally, each window in the "zig zag corridor" had an accompanying narration, "explaining" the imagery seen outside each window. This is first-class scientific nonsense, and getting it back in the mix was made possible through a Mike Lee recording from 1990. There were originally five separate narration tracks, three male and two female. In Mike's recording the second female narration was too low in volume to capture the whole thing, so a mere sample is represented here. 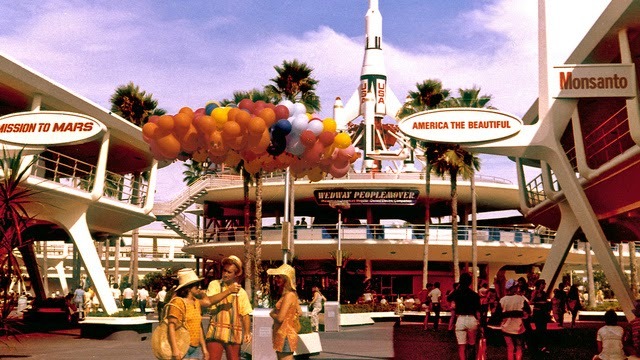 Once into the load area, the fourth distinct 1975 ambient piece, released on Walt Disney World Forever as "Warp", can be heard in vintage recordings. This is also the proper location for our "Com Chat", a track prefaced in the Zig Zag corridor by the last window announcement and also by the prominent placement of the ride's control tower. The "Warp" track also played on the ride's lift hill until 2009. MK's original "blue tunnel" sound effect sadly was retired before a clean copy of it could make it way online. The one heard here was recorded by Dave McCormick. The lift hill sounds were recorded by me in 2013, and the original safety announcement and "re-entry" sound effect comes from a track pack of Disneyland Space Mountain sounds that circulates amongst collectors. The clanks and screams of the original on-ride experience comes from Martin's Smith's on-ride video from 2008. The original RCA Home of Future Living exit song and music no longer exists in a quality copy. The best version is available on WaltsMusic.Com, in which the music and vocals are separated into left and right channels, allowing a reconstruction of the original 1975 loops. The version of "Here's To the Future" without the pop vocals also played in the WEDway Peoplemover tunnel above the exit show. The final track is "Neutral Strings in Motion #3" by Neil Amsterdam, from Capitol Media Music, representing more of the original WEDway loop. Thanks to Greg Maletic for suggesting the soundscape at the exit bleeding out to the sounds of the Speedway, a detail I had entirely forgotten since the ride has been enclosed by an arcade for twenty years now. ...it's going to be a great time! This wonderful Tomorrowland track has been added to the Disney Avenue Music Player for you to listen to it whenever you'd like. See you right back here tomorrow where we'll continue our tour of vintage Walt Disney World and part 2 of Tomorrowland!